The Wabbit saw Lapinette kick the figure and it lurched towards the door. But it bounced back and swirled the edged weapon round and round. She kicked it again, but it kept coming. He heard a hiss as Skratch opened the doors. Outside the night blurred past. The figure swayed and grabbed a rail. Whatever the figure was it had to leave of its own accord or the game would continue forever. The Wabbit pulled out the automatic but he held back. Killing it wouldn't help. He fired a shot at its ear. Blood spattered the compartment. The thing hit the door and nearly fell out. Its feet slithered on the floor. "I'm still here!" The shout was triumphant. The slipstream tugged at its fur. Its teeth chattered. The train slammed through a tunnel and the draught sucked the thing half out. Brickwork scraped its back. Its yell was frantic. "I'm not leaving!" It had one foot inside and another out. Lapinette gave it another push and shouted, "Give up!" "Never!" yelled the thing. It clawed his way back on the footplate. "Whoooo," said a voice that seemed to come from the wind. The thing turned - and just for a moment, lost its grip. It stared at the Wabbit with what looked like despair. Its hold loosened. With paws raised in surrender it fell to the track. 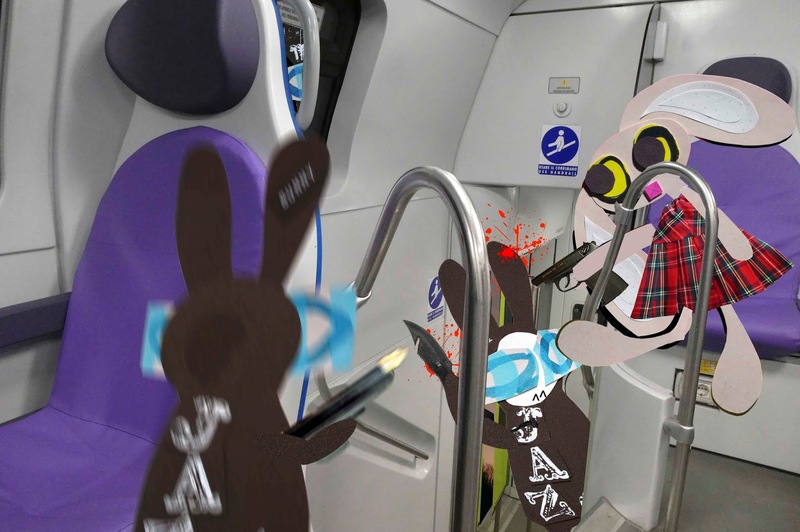 The Wabbit grinned as he watched Wabsworth climb into the compartment. The doors hissed shut. "Ticket?" smiled the Wabbit.